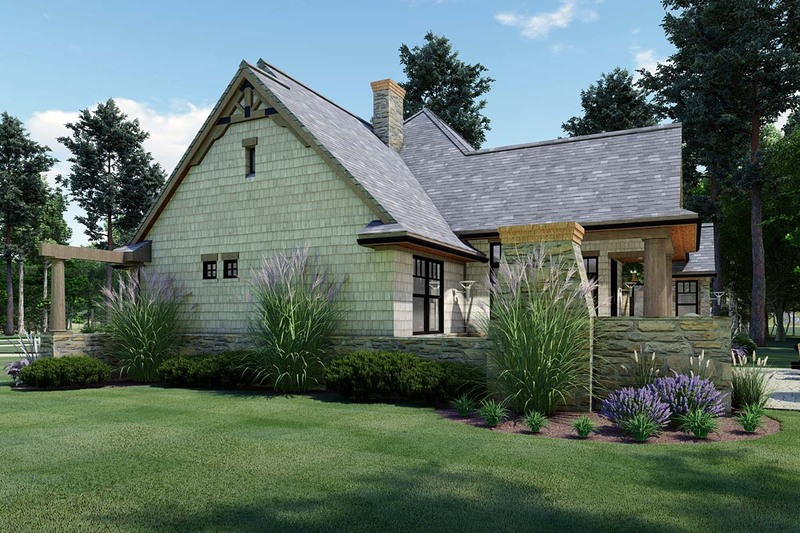 Houzz 402 of our visitors have told a friend about this plan. 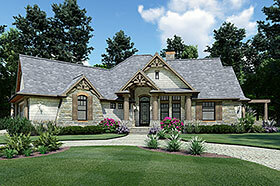 3 car garage option for this Tuscan home design is an additional $150. Please call to order. 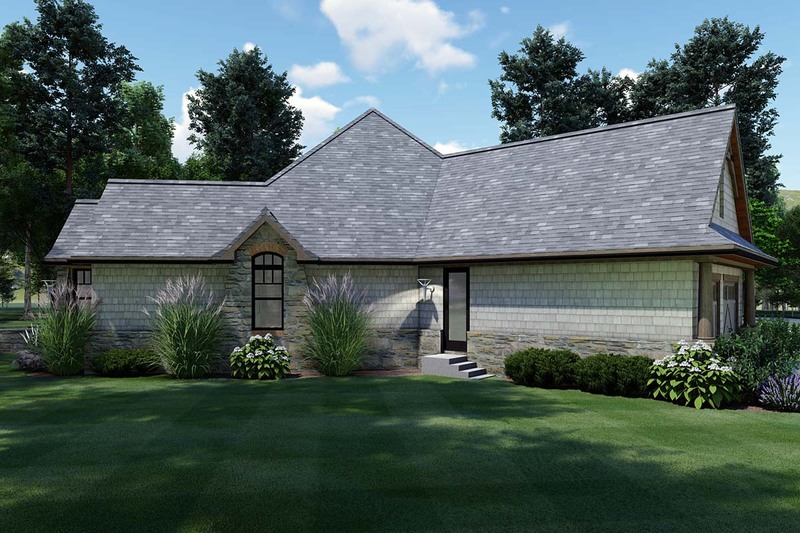 Ceiling heights: Family Room, Great Room, Kitchen, Dining Room and Nook- 12', Master bedroom- 10' going up to 11', master bathroom and closets- 10', bedrooms-10'. Question: What version of AutoCad are the drawings? Are they AutoCad Architectural, Revit…, or can I use general AutoCad to make what ever modifications I need? Answer: We use regular old Autodesk AutoCAD 2014. Yes, you can use any software that uses dwg files. Answer: We have a 3rd car option available for an additional $150. The width is 83’-8” . Question: For the log siding, is it round logs or machine flat logs? Answer: We specify shake siding for this plan. We have another plan, similar to this one which does specify log siding which is not whole logs, but log siding. Answer: 83’-8” wide x 71’-5” deep. Question: what are the dimensions of the pantry? 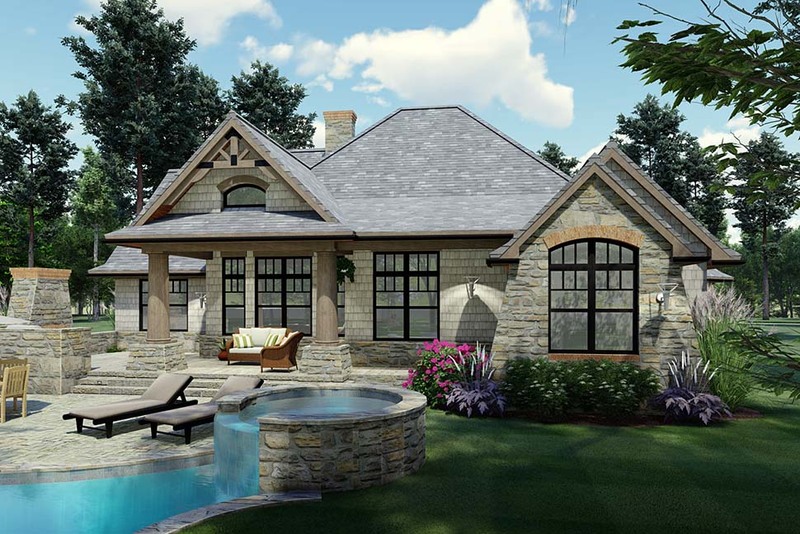 Question: What are the dimensions of the outside area between the Lanai and the Master bedroom? I wondering if it would be big enough to make into a screened porch. Question: What is the height of the front porch roof at its ridge? Answer: 23’ to the top of the higher of the two gables. 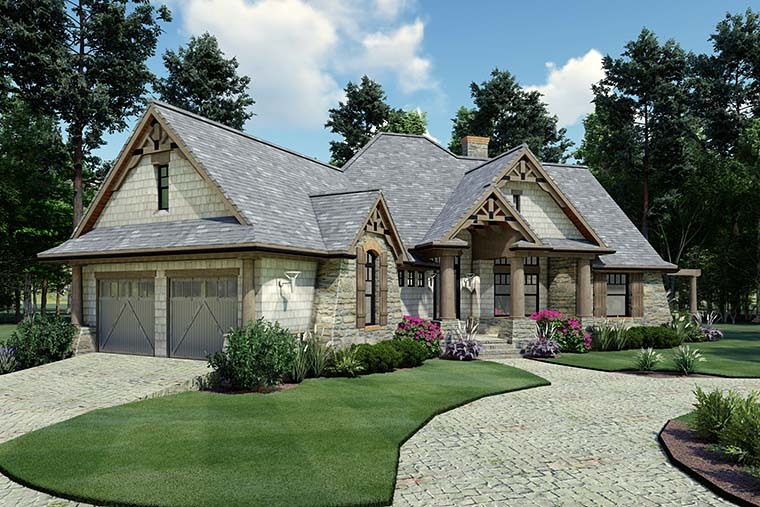 Question: What is the height of the front door dormers in comparison to the roof height? Answer: 2’ taller plate heights – 10’ vs 12’. Question: What is the total square footage under roof on a slab foundation? Question: What would the wide of the house if you do the 3 car garage? Answer: 83’-8” not including the decorative trellis on the right side. Question: Also, the ceiling height in the bonus room is 9 ft...what is the height of the side walls? Question: What are the dimensions of the utility closet? And the foyer? Thanks! Answer: Yes and yes. These are changes that you can employ locally. Answer: Steve, We do provide roof framing plans for ‘stick framing’ via dimensional lumber. We do not provide calculations nor are they ‘engineered’ as we cannot assume loading for every area of the country. We use industry standards and load/span tables as published in the 2012 IRC and as required for our location here in Texas. We also do not provide a truss framing plan for the roof(some people do request this also). We do provide foundation plans(slab, crawlspace and basement – options as priced with FamilyHomePlans), again using the 2012 IRC and they are not ‘engineered’ and may need some local engineering/modifications. We provide details where we deem necessary to explain a detail that is non-standard for conventional framing. Hope that helps your decision making process. Question: What type of siding was used on this model? Answer: We recommend Hardi-Board. They have a shake siding that looks and performs great. Answer: 3602 SF of covered area. Question: Can the plans be modified to use Nudura ICF technology? Is the roof stick framed or can it be done with manufactured trusses? 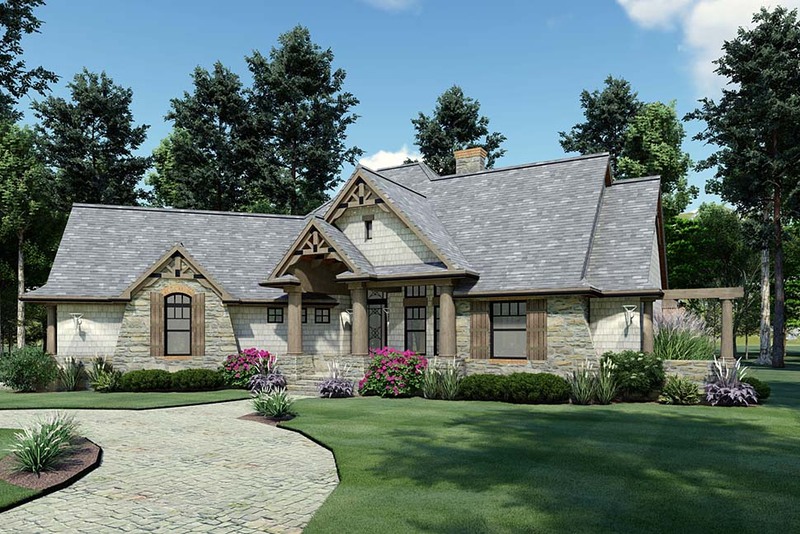 Can we buy the Archtectural Arches over the entry and gables? Are they prefabbed? Answer: Plans can be modified to use ICF. Roof is stick framed but could be trussed. Decorative trusses on gables are a custom order. Question: What is the roof elevation? Is there room in the attic for an unfinished bonus room in case we need it later? Answer: Yes, plenty. The roof pitch is 12:12. Answer: The stair to the basement and the bonus are in the garage in our design. That could be modified (for a fee) to hall access though. The workshop is also in the garage, but could be partitioned off as part of the stair connection. Question: Has this house been built anywhere near ontario, canada? 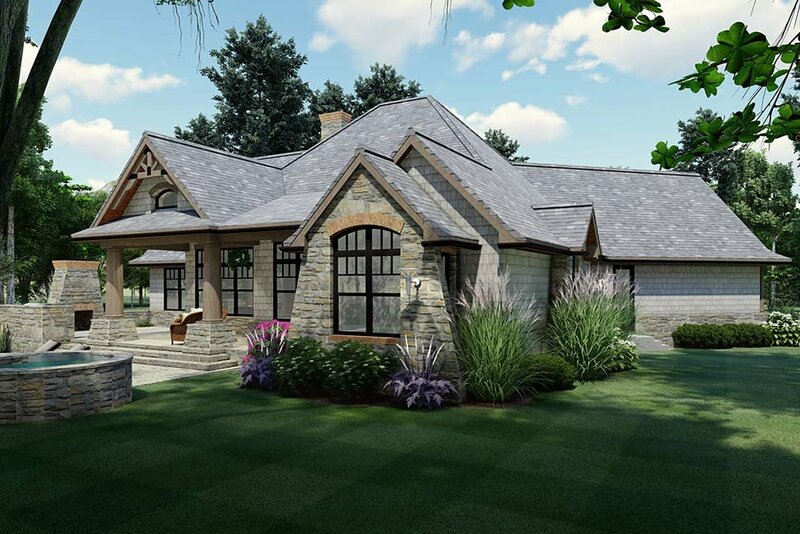 Do you have an idea on what the total cost too build this house might be? Is there inside pictures of the home of one that was actually built? Question: Is this house built anywhere in TN? Answer: Don’t have any info on that. Question: What is the inside depth of the third garage to the wheel stop? Answer: We show about 16’ with a 6’(+) walk beyond that, so it could be deeper. Question: If you choose to have the bonus space with this plan, can you still have a basement or do you have to choose one or the other? Answer: They both come with the plan and are not mutually exclusive. Question: Thanks for the answer. What is the new square footage of the bonus room with the 3-car garage? Question: This plan appears to come with a 3 car option and I would assume the optional bonus space would meet the requirements. Can you verify? Answer: It does come with a 3 car and the bonus room becomes a T-shape with space expanding towards the rear of the garage where the 3rd car bay would be. Question: Is there enough room to make utility room into a half bath and move utility room to work shop? Answer: Yes there is plenty. Question: Is the storage room and work shop part of the garage grade or is it on the subfloor level. It looks like the storage room is on the subfloor and the work shop is part of the garage. And if so could the walls between the storage room and the 2 walkin closets in the master bedroom be eliminated to make 1 large walkin closet? Answer: The workshop and storage are on the garage level in our drawings. However you could easily modify the wic’s to claim space from the garage. Question: Would it be feasible to have it a vaulted and or cathedral ceilings instead of the coffered ceilings? Answer: Yes. Would probably still leave the designated squares and vault inside of them. Question: Is a material list available? Wall studs, sheetrock, plywood, etc? Answer: Sorry - no there is not. Answer: Bonus is area you have the option of using or not. We can reverse the plan from left to right, not back to front. Question: Do you have any interior renderings of this plan? If you do, could you please send them. thanks. Answer: They are nearly identical to the interior renderings for plan 65862. Question: Is the living room vaulted? Answer: It is stepped (coffered). Answer: Not for this one. Answer: The square footage is just the air conditioned space. No porches, bonus space or garage areas were included. Question: Can this be built with a walk out lower level? Question: where would the steps go in the house to get to the basement. Answer: The basement stairs are in the Garage going from left to right. Answer: In this plan it is only accessible from the Garage... unfortunately. Question: Can you send me some pictures of the inside of the home so we can visualize the layout better with kitchen cabinets and furniture etc. Answer: The interior layout is the same as plan 65862 with the exception of the views of the study. Those interior renderings will show how it looks. Question: Do you have any rear elevation photos with a walk-out basement? Do you have any interior pictures? Answer: The interior renderings are similar to our plan no. 65862. The only difference is the elimination of the Study/Media in lieu of a workshop area in the Garage. I have attached a sketch of a walk-out basement condition. Question: where are the furnace and water heater situated? how does the laundry area vent out? Our working drawings include the following.. Floor Plans - For each level we include... a 1/4"=1'-0" scale floor plan indicating frame walls and masonry with dimensions, notes, door and window sizes, room names and floor finishes, cabinet, shelving, fixture locations and notes, ceiling conditions, electrical/lighting fixtures and switches. Exterior Elevations - We include... Front Elevation at 1/4"=1'-0", side and rear elevations at 1/8"=1'-0", plate heights, roof overhangs, material/surface notes, window heights, roof pitches, material hatching for clarity, floor to floor dimensions and any other detail we feel is necessary to explain the construction. Cabinets/Building Sections- Cabinet elevations at 3/8"=1'-0", showing cabinets, appliance locations, plumbing fixtures, shelving, counter/backsplash surface, cabinet material and finish, niche details and any other special situation that cannot be understood from the plan view. Building Sections are included only when there is no other way to indicate the spatial characteristics of the home. This information is quite often indicated well enough on the elevations and plans. Foundation Plans - We offer a choice of three types of foundations, full basement, crawlspace, and slab foundations. 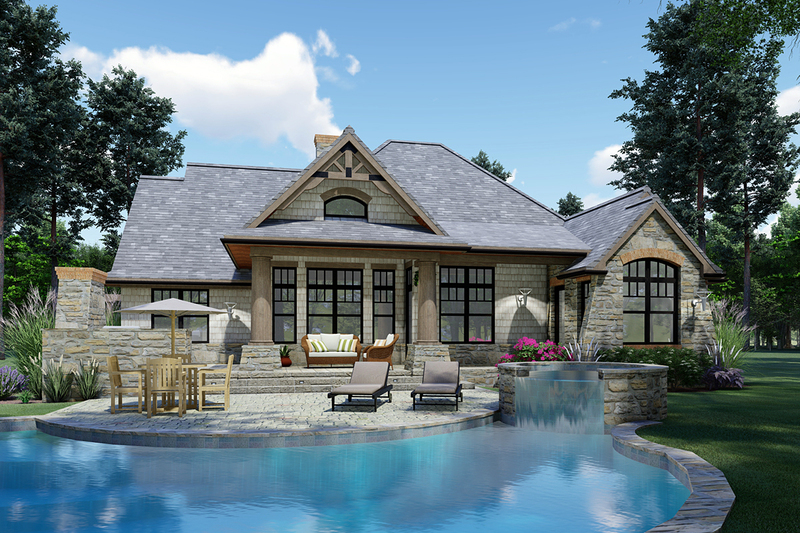 Each comes fully dimensioned, and noted indicating wall composition and thickness, construction detail references to our detail page, beam, pier and column locations and sizes, stair locations for basements, reinforcing steel sizes and step downs in monolithic slabs and ventilation grilles for crawlspaces. Framing Plans - For each level we include... a 1/8"=1'-0" scale plan indicating rafter, ceiling and floor joists locations, sizes and spacing as well as lumber grade specified, additional bracing and blocking. Details - For each foundation type we include... 3/4"=1'-0" scale details indicating material composition, size and critical dimensions for construction of the primary foundation. Click Here to download a free PDF Brouchure of Plan Number 65867. Walkout Basement - * $300.00 Total Living Area may increase with Basement Foundation option - please call to confirm before ordering. Phone: 866-465-5866 - Talk to a live person that can give you and FREE modification estimate over the phone! Fax: 651-602-5050 - Make sure to include a cover sheet with your contact info. Make attention to the FamilyHomePlans.com Modification Department. Email: Click Here. Please Include your telephone number, plan number, foundation type, state you are building in and a specific list of changes.